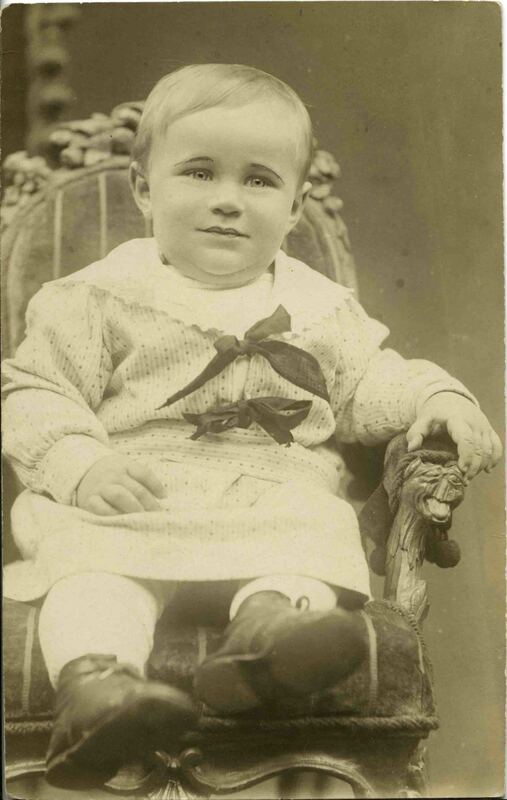 Last week, I spent a lot of time scanning old family photographs, and wanted to cry when I reached the photographs of my great-uncle Hans as a baby, because they made me think about his mother. Hans had no idea that the woman who raised him wasn’t his biological mother until he reached adulthood, because my great-grandmother Helene treated him as her son from the moment she married his father (my great-grandfather) 5 days after Hans’s 4th birthday. Hans’s biological mother Rosalia had died just 10 months earlier, in May 1907, of tuberculosis, and though I have a bit of a hard time believing that a 3 year old would not recognize the lack of a mother for a 10-month period, it’s possible that Rosalia was so sick for parts of his young life that he spent the majority of time cared for by nannies (they were well-off enough to have such servants) or by other relatives. Or maybe the loss of his mother was so traumatic and sad that Hans erased it from his memory, choosing to remember his entire childhood as having been lived with the wonderful Helene. Whatever the case, Rosalia, the mother who bore him, probably dressed him for the above photo postcard, and likely sent the finished prints to her family and friends, was forgotten by Hans and his descendants, her identity (her name, the particulars of her death) unknown to his children until a few years ago, when I uncovered them in Viennese vital records. I kept thinking of Rosalia as I scanned these photographs of Hans as she knew him, thinking of the love that she must have felt for her baby who would grow up to not remember her at all. Hans was born in March 22, 1904 in Vienna, Austria, to Rosalia and Emil Hoffer, who had married about a year and a half earlier, and may or may not have been cousins. I know very little about Rosalia and her family, but I do know that her father Bernhard Fischer was the godfather to Emil’s younger brother Friedrich, who was just a year younger than Rosalia (and whose daughter, Belle, would give my mother her first flute). Coupled with the fact that Emil’s mother was born Katharina Fischer, this suggests that there might have been a blood relation between them, especially as cousin marriages were not unusual at the time (or in this family — Emil’s older sister was married to another Fischer first cousin). Rosalia died in the couple’s summer apartment in Mödling, outside of the city at the end of May, 1907. My grandfather, the son of Emil & Helene, was born 2 years later in this or another summer apartment at Demelgasse 14, Mödling. I don’t know the address of the apartment where Rosalia died, but I simultaneously hope it both was and wasn’t the one at Demelgasse 14. Rosalia was buried a couple days later, according to Jewish custom, in the Vienna Zentralfriedhof (central cemetery). Helene was a good mother to the two boys who would grow up to name daughters after her. Of Rosalia, though, the mother who died so early in her son’s life, nothing has been passed down through our family at all — that is, not consciously. I like to think that the light hair and eyes of baby Hans — who was so fair when the above photograph was taken that the photographer colored in his pupils and eyebrows with black ink to make them visible — came from Rosalia. I like to think this because there are no photographs of Rosalia that might disabuse me of this belief and because there are no other blond Hoffers — none, that is, except for some of Hans’ grandchildren who grew up to be adults with light hair and eyes.